- You are an author of Parenting ADHD Now, a creator of Sanity School for Parents, a management training program for parents of complex kids. Why do you think that there's been such an increase in ADHD diagnosis? - Part of this increase in diagnosis is that we know more and we're able to identify better, earlier. We're able to do early intervention. We're able to identify kids who are struggling who might have in previous years come under the radar and ultimately failed in life and in life and in school. I know I struggled a lot I know you probably did. And I know a lot of people did. - I did, school was terrible. - It's sort of a yes and. Yes I think there is this challenge to the environment that we're living in that's stressful and requiring too much too early. And taking kids out of nature, I agree with all of it. And my god, we know so much more and what a difference that it's really able to make for our kids when we are able to identify early what's going on for them that they're struggling and get them the supports they need. - Do you believe that there is not an ADD diagnosis? - I think I've sort of shared the opinion that at some point it doesn't matter what you call it. What matters is that we have kids that are struggling. And families that are struggling to help their kids be successful. Whether it's environmental or genetic or both. This is where you are and this is what your child is struggling with. And so for you to understand what he's struggling with, impulsivity and disorganization and distraction, etc. And to help him learn to manage it. To understand it yourself well enough to help him learn to manage it. That's really what it's about. And some parents choose to use medication. Some parents choose to use exercise and nutrition to activate the brain but you have to understand that the struggles are real for this child and the focus is, how do we help this child be as successful as he can be. I ask them first is when a parent comes to me and says their child is diagnosed, my response is some variation of great, yay, because now you know what you're dealing with and now we can begin to work towards understanding what your child is struggling with and how to help that child be successful. So as you said earlier, the value of diagnosis is the opportunity to understand better what's going on and help the child. And as to whether it's over-diagnosed or under-diagnosed, what I can tell you is, I work with parents all over the world who are dealing with this diagnosis and all over the country and it's not an easy diagnosis. To get to an ADHD diagnosis is quite complicated when it's done well and it requires a lot of engagement from the parent, from teachers, from professionals. And most of the time, by the time you get to a diagnosis of ADHD, there's been struggle and problems going for a long time, it's not like you just dive onto an instant diagnosis, it's not that easy. And so usually by the time a parent gets a diagnosis, even if there is some denial or concern involved there is also a sense of relief that they've been struggling for a long time to understand something and they're beginning to get some clarity. If you do not give a child an explanation for why they are struggling with reading as a dyslexic or why they are struggling with impulsivity as a child with ADHD then they will make up that they are crazy, they are lazy, they are stupid, they are bad. And that's not the message we want these kids to be making up for themselves. We want to help them understand themselves and a diagnosis does that really well. And if the child is being well treated and the parent is being well supported, if it's not the correct diagnosis, it doesn't take that long to figure that out and begin to work through and figure out what really is going on. Because a lot of issues look like executive function challenges and can look like ADHD, as has been pointed out. So we do need to continue active treatment and engagement but to throw the baby out with the bath water doesn't really help anybody. - What kind of accommodations can an ADD child get in school? - So there's a large range of accommodations. It depends on many factors. It depends on whether the child has an IEP or 504 plan. There are two different approaches to getting that kind of support. Just to explain, accommodations are designed to level the playing field, if you will. To help kids who are struggling have a fair advantage to demonstrate their knowledge and their ability to the teachers that they are working with. So accommodations can be minor like seating in a classroom or getting the prompts for younger children, getting a writing prompt the day before so they have a chance to think about it before they get into the classroom the next day. Or they can be more complicated, arrangements for how and when homework is turned in or extended assignments or reductions of workload. A child may be given odd numbers of problems in math assignments instead of every problem if processing speed is an issue. So there is a wide range of accommodations and what's most important is that they have to be individualized. - And Elaine, what's your website? - Our website is impactadhd.com and it is a resource for parents not on the information about ADHD as much as its about how do you manage it. What do you do in a day to day situation when you're trying to minimize the meltdowns and handle the homework headaches. So it's a very strategic, direct, coach approach to how you raise complex kids, it's impactadhd.com. - It's a great parent education tool. You are a great parent educator. Thank you so much all of you for being here today. Finding a child's motivation to "get it done"
Is ADHD being overly diagnosed? Is it possible to fix a learning disability? Elaine Taylor-Klaus is a change agent: a mother of 3 complex kids, a parent educator, a writer, a health care advocate, a community entrepreneur, a public speaker, a facilitator, and a compassionate listener. She is also a certified professional coach, providing support for families around the globe raising children with complex needs. Elaine feels passionately that parents deserve compassionate guidance and effective skills when raising “complex” children. She coaches and trains parents to take a “coach-approach” to parenting, empowering their children to lead independent, fulfilling lives. The co-founder and CEO of ImpactADHD.com, a virtual training and coaching resource for parents of kids with ADHD and related challenges, Elaine is a writer for publications like Huffington Post, Attention and ADDitude magazines. A regular presenter at national conferences, such as CHADD (Children & Adults with ADD) and the LDA (Learning Disability Association of America), she serves on the national Board of Directors of CHADD, chairing the Membership committee. She also serves as an expert voice for parents as part of Pfizer’s Making Moments education campaign. Prior to coaching, Elaine served for 8 years on the Executive Committee of Georgia’s Governor's Council for Maternal and Infant Health, and worked in the field of women’s health care on a national level. She is a graduate of Wesleyan University in CT, a CORO Fellowship, and CTI’s Co-Active Leadership Program, and is part of Georgia State University’s Activist Women’s Archives. 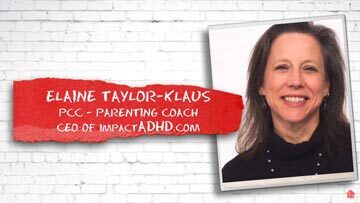 Elaine is the mom in an ADHD Family of Five, living in Atlanta, GA with her children and husband, David Taylor-Klaus of DTKCoaching.